To fully evaluate my Media products for the G324 Coursework I have to answer the following questions. In what ways does your media product use, develop or challenge forms and conventions of real life media products? 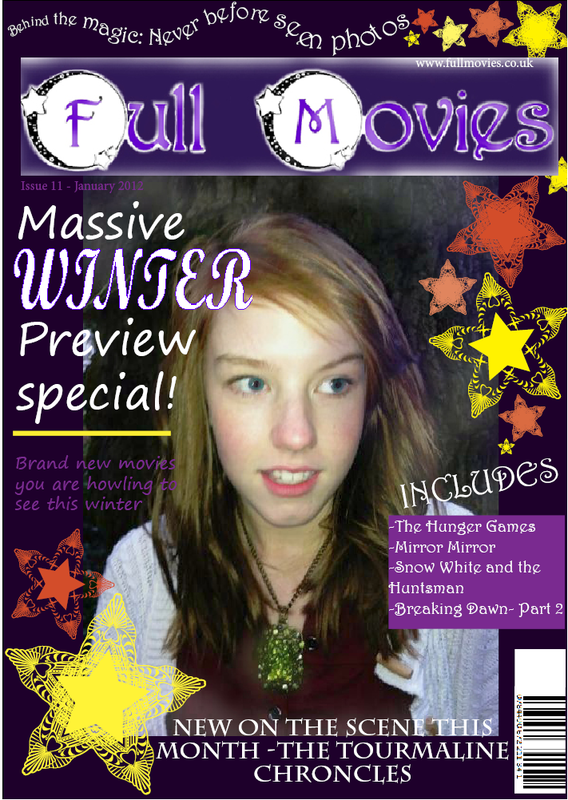 This is the final draft magazine cover I have designed to promote my film. I have made sure that I have kept to my intended colour scheme and to protect copy righted images, have taken my own original pictures of my character. Whilst I was creating my magazine cover, I realised the consistancy of the theme through my pieces was going to be hard to follow since it is set in woodland and the colours are quite bright. However I decided to incorporate a pattern that I made on Illustration that used the same colours. The developments I have made since my last draft was I added more of the stars so that it flows round the title like the leaves on the poster. I also after noticing that some covers do this I have a line under each article to seperate them. I really like at the moment the headline above the masthead because I used a tool where I draw a line and I can then type on to it. I didn’t want to include too much on to the cover as it will look far too busy and will spoil the main image. 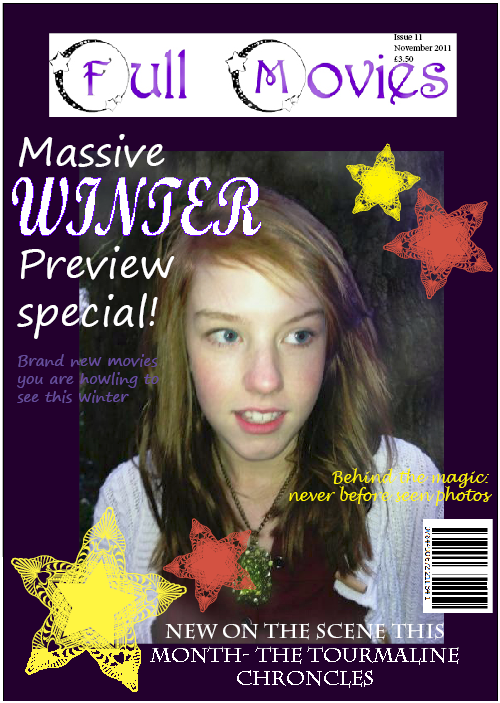 Here is the final magazine title that I have created using a fonts website and Photoshop. I went through many decisions ranging from colour scheme to effects to get my final title. It started firstly all black and white and then I managed to change the colour to purple as it was my chosen colour scheme that I had shown in the mood board and suited the genre of the magazine and the film. I am very pleased with the effect that I have attempted, using the eraser and brush tools on Photoshop to get the different shades. I added these to the parts of each letter making it stand out over the moon and stars that is around the first letter. I don’t think I will develop this anymore, because I feel it looks good as it is and there is a chance I could spoil the look of it. 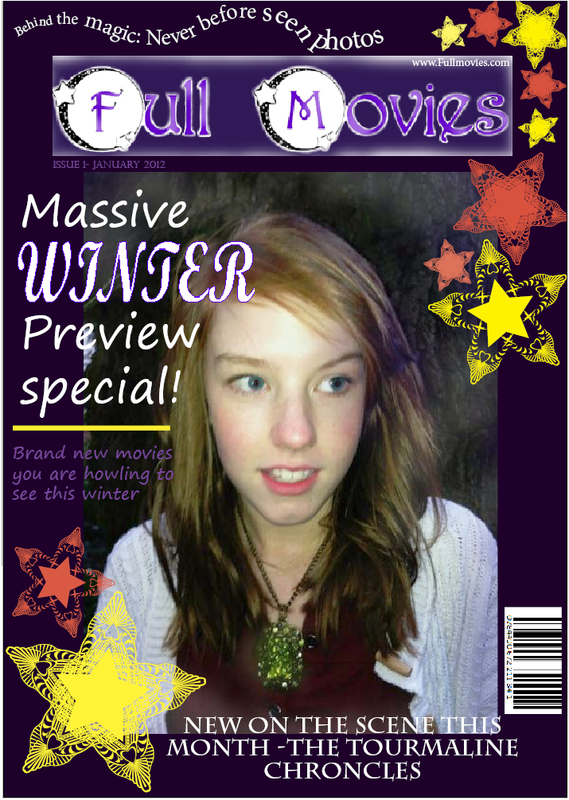 As well as the Film Poster, I have also been concentrating on the magazine cover which features my film and main character. Throughout my time working on this I have managed to use the Adobe graphics package available which includes Photoshop and In design, both I have managed to use to create my print products. 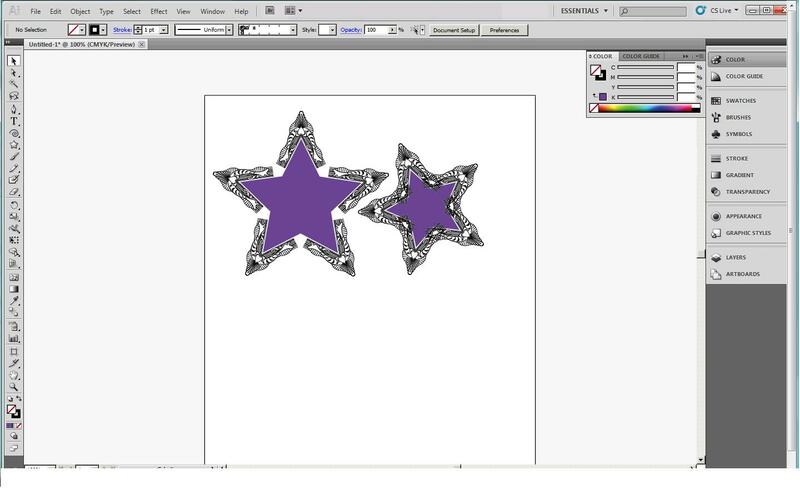 Through my exploration of these programs I have also learnt about another called Adobe Illustration. It provides many tools on creating a variety of pretty patterns and shapes that I could possibly incorporate into my coursework. 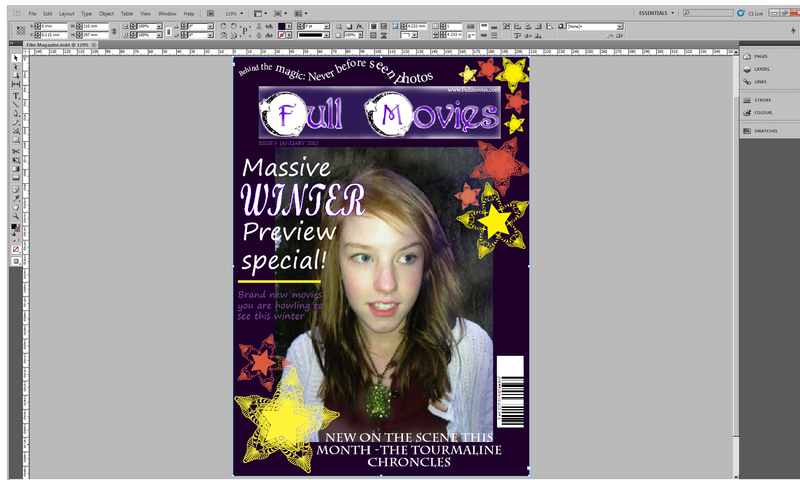 Here is the magazine cover so far. 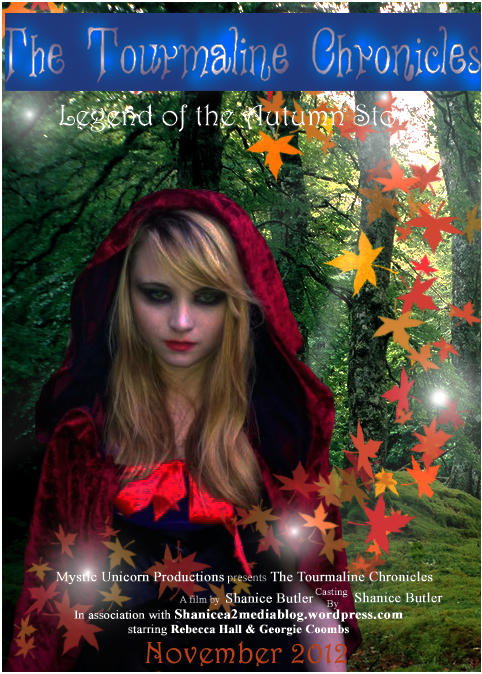 I have attempted to use different fonts and used a foggy effect on the image with a purple tinge so it goes with the colour scheme and to make it look like the character is in a dark forest. My main character is standing in front of a tree and her face is quite dark however using photoshop I managed to touch it up by brightening it. Just looking at it, I already think that there is a lot I could improve on such as making the title bigger and also removing the white box around it and perhaps make the picture more part of the background. I like the name that i have given it due to the play on words and the font looks quite mystical. This overall links to the moon in the chosen font which represents the genre quite well. I quite enjoyed playing around with the colours on the font becuase I managed to add a mixture of shades of purple. I did this by making the title a block colour and then got the eraser and brushed over it, turning the opacity up and concentrating on the top area of each letter. I feel that it looks more interesting with this effect. I decided to not include a lot of headings of the features that would be inside becuase I don’t want to swamp the piece in text and the main image to still be visible. I used in the titles some catchy words that reflect the genre and film such as ‘New on the scene’, ‘Brand new movies you are howling to see this winter’ and ‘behind the magic’. To keep it professional, I have added a barcode towards the bottom on the page and the issue number, date and price of the magazine. Here is the first draft of my film poster that I have managed to create using Adobe Photoshop CS5. There have been some minor adjustments since the last one such as the title which has been finally added in and an extra character is in the background. There is also now some typical conventions that a professional film poster has which is the information and the date the film will be released. To create my film poster I firstly got the image that would work best on the front and changed the saturation and contrast of it so it was brighter and a little bit darker. I then lassoed it so that the shape of the character was selected and dragged it on to my forest background and posistioned the image over the far side of the poster so that there was room to see the scenerey and my other character. I found it quite difficult to edit the background as I wanted it to look quite sunny and mysterious so I used a normal paint brush and drew in the light beams coming down from the gap in the trees and decreased the opacity. This proved to be quite hard as the day I filmed on and took the pictures was quite foggy and dull however this worked out better for the filming as it was dark inside the forest which helped my actors perform well in the surroundings, making it seem more believable even if it was really cold! I had to try and make the pictures look the same as the background so that it looked as if she was actually in the forest. I have found the layout of the poster has changed, this is because I have come up with new ideas since my plan and some of the things I wasn’t able to do such as blending images in with the background. Through my research of posters I have seen that many have the villain on it and even a main character and there would also be other versions of it. I like how I have given this possibilty, meaning that it can be changed for any place it will be advertised in, such as in form of a magazine advert or billboard in a local cinema.